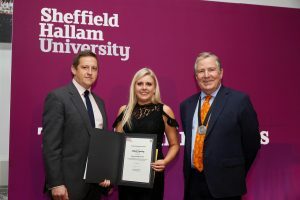 Graysons is delighted to have sponsored two of the law and criminology awards at Sheffield Hallam University again this year. At a packed presentation ceremony, held this week at the university’s City Campus Hallam Hall, Graysons’ head of business development, Chris Rodgers, presented the Graysons Family Law Award and the Graysons Law Clinic Award to the winners. Abigail Capeling won the family law prize for gaining the highest mark in the family law module of her law degree. Hailing from Lincoln, Abigail says she has been interested in becoming a solicitor since before taking her GCSEs and has previously carried out work experience at a national legal practice. She currently works as a volunteer for the PSU (Personal Support Unit), which is a charity that helps people with court issues. Abigail is particularly interested in family law and presented her dissertation on finances and children law. Abigail will now undertake her Legal Practice Course (LPC) at the University of Sheffield. 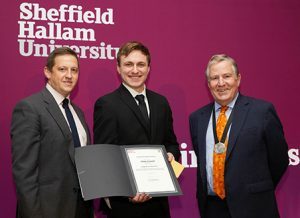 Adam Connell won the law clinic prize for making the most worthwhile contribution to the law clinic, which provides a free legal clinic to staff and students at SHU, as well as to the public. He managed his own divorce case whilst part of the clinic. Adam, who is from Castleford says he has always been intrigued by the legal sector, and at one point he was interested in joining the police force. That changed, and he has decided to pursue a career as a solicitor. Again, he is particularly interested in family law and, after a well-deserved year out, will pursue his master’s degree in law and his LPC next year. Very many congratulations to Abigail and Adam on winning this year’s prizes. We wish you the best of luck in your future career.